and despite growing under a pine (several pines) it’s lush and lovely. I just wish it faced the lawn instead of the alley. 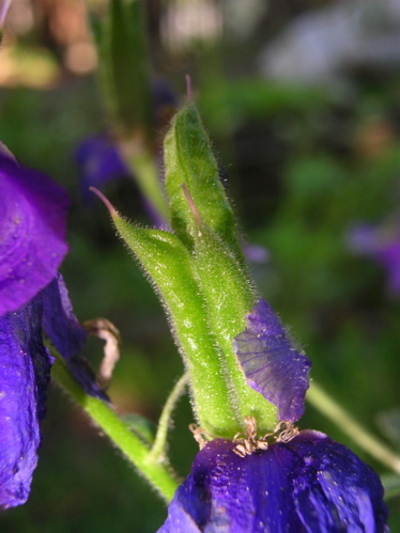 The larkspur, the west’s native delphinium, eschews the excessive height of its cultivated cousins. 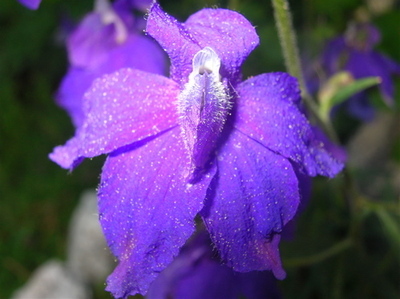 Where those cousins have a pale, spring-like foliage, the larkspur’s deeply cut leaves are quite dark, as though a touch of the hue from its deep purple flowers had passed into them. 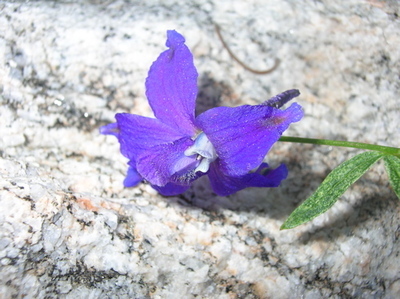 Not needing to produce masses of foliage and a huge stem, the larkspur blooms in late spring to early summer, like so many Rocky Mountain wildflowers. and some have already formed the three-pronged pods that will later separate at the tips, dry, and burst. We see larkspur in meadows and clearings beside hiking paths in Yellowstone and throughout the mountains near Bozeman, its intense purple beautiful against the green of grass or the brown of pine needles. I cannot believe one has deigned to grace my garden with its loveliness. Looks like your garden was dressed perfectly for the event. Very pretty blue. Hey,no worries. It was worth waiting for. Do they grow in the woods near you, Amy? Wow what amazing flowers!!! 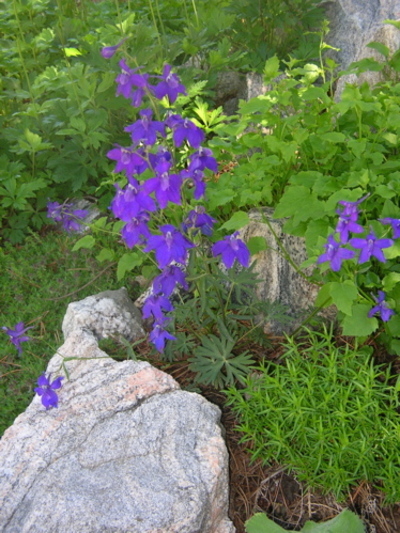 I never thought of planting larkspur in a rock garden before. 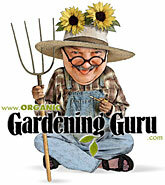 I think that I will have to plant some next spring next to my orchid garden bed. 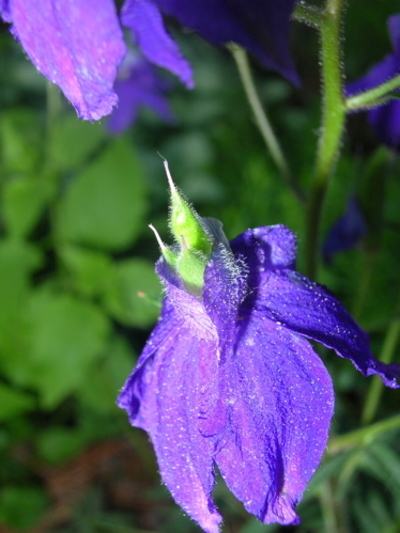 I just hope that the larkspur requires the same maintenance as the care for orchid plants that I have so they can all be easily maintained together. Thanks for the great idea, Joan. At times you get to see plants in surprising locations. Awesome flowers. 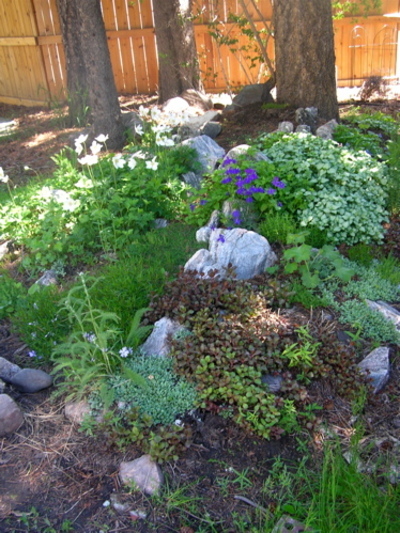 Growing rock garden is an excellent way for utilizing sloping lands into a beautiful flowerbed. 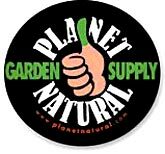 General hydroponics is the best way to grow rock garden.